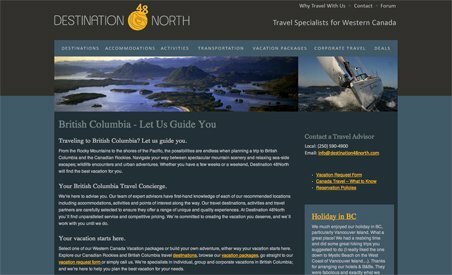 If you’re planning a trip to Alberta or British Columbia, let Destination 48North be your travel concierge. As Western Canada specialists, they are committed to giving you the best vacation experience possible. Travelers can purchase travel packages or custom-made itineraries. The staff at Destination 48North will find you the best places to eat, the most comfortable places to stay and the most exciting things to do. As their staff lives and breathes Western Canada, they can provide opportunities that you wouldn’t be able to find on your own. If you’re planning a trip to Alberta or British Columbia, let Destination 48North be your travel concierge. As Western Canada specialists, they are committed to giving you the best vacation experience possible. Travelers can purchase travel packages or custom-made itineraries. The staff at Destination 48North will find you the best places to eat, the most comfortable places to stay and the most exciting things to do. As their staff lives and breathes Western Canada, they can provide opportunities that you wouldn’t be able to find on your own. Destination 48North also promotes green travel by partnering with companies who use the latest in power and water conservation, organic cleaners and local food providers. By working with travel partners they respect, Destination 48North can provide an affordable, truly authentic West Coast experience.